To get started, all that is required is to enter a date on the order book to create a new entry, all the site details are automatically included along with any stage notes that may subsequently be added. Each stage of the order process can be set up in a custom list that reflects the exact stages of your order process for your particular company. Each company has its own process so we can include as many stages as are required to complete the task. Each stage can be accompanied with a status note that is dated along with the time so you can quickly see how long ago the note was made. These notes are included within the main timeline notes for that particular site. Once the order is complete, enter a completion date and the job is done. For quick reference you can see the number of orders received and completed in your dashboard for the last 3 months, another great tool for quick reference to show the performance of your business. 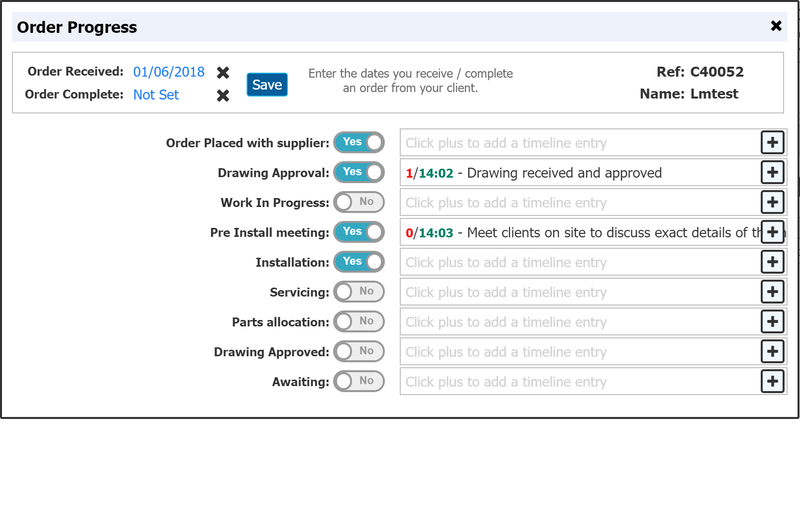 If you would like to know more about our order book feature or the order progress system, please do get in touch for a full demonstration of how it works and how it may help your business.